Once upon a time, I didn’t know what romance tropes meant. I just knew themes I loved writing about: friends to true love, woman in jeopardy, second chances, opposites attract. Then I heard about popular romance tropes and realized about my ignorance. In time, I added more tropes to my list, and some of them took me by surprise. For example, I never thought I’d write a marriage of convenience story. But then I had an idea for a book that would work only as a marriage of convenience, and Season of Mercy was born! I love the idea of having a second chance at love. Even more, I’m grateful that God forgives our mistakes and gives us second, third, thousandth chances no matter how many times we fail. Even if we don’t give ourselves a new chance often enough. So it’s no surprise that second chances is the theme of many of my books. 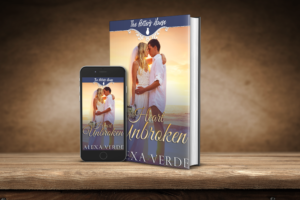 A former drug addict, Emma Hughes in Heart Unbroken desperately tries to rebuild her life and regain trust of her little son she’d once left behind. She doesn’t expect a second chance at love, much less with a sheriff whose wife was killed by a junkie. I love opposites attract trope! Emma and Rodrigo are the last people who should fall in love with the very person they feel they need to avoid. Or maybe they should? God often bring people together because they can help each other heal and be happy together. Speaking of healing… Who should a scarred man with anger issues fall in love with? Of course, with a gorgeous star, who suffered at the hand of someone who couldn’t control his anger! And so Heart Healed was written. Can Philip hope that the beautiful singer will respond to his feelings? Can Miriam survive long enough to see the beauty of Philip’s soul instead of his scarred face? But no matter how different Philip and Miriam are, God brings them together because they are perfect for each other. What I love about my favorite tropes is one of many things I love about Christian romance. The message of love, faith, and hope that touches my heart. 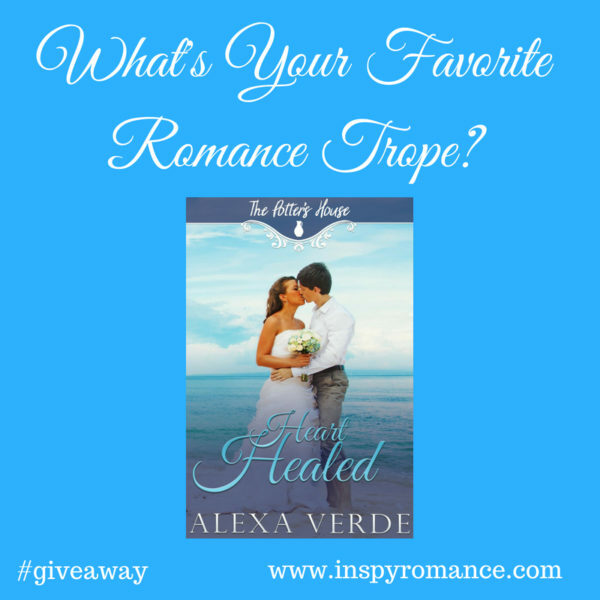 What’s your favorite romance trope? I look forward to reading your comments. Giveaway! 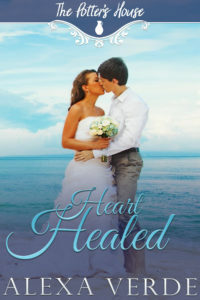 I’m happy to give an ecopy of Heart Unbroken and an ARC ecopy of Heart Healed gifted via BookFunnel to one randomly chosen commenter to this post. The giveaway is open until 6 p.m. CST on August 15th. Yes, there is such a trope, I believe! And I don’t like love triangles, either. I always think, what if she doesn’t choose the guy I started to like, lol? Thank you so much for commenting! Thank you so much for sharing, Sherri! Totally agree about marriage of convenience stories! To be honest, I thought it would be difficult to write a modern marriage of convenience story that is believable, and the story just appeared in my head! Hi, Alexa! My favorite is second chance! I absolutely loved Heart Unbroken, and have Heart Healed on pre-order already!! Hello, Paula Marie! I’m thrilled to hear you loved Heart Unbroken, and thank you so much for pre-ordering Heart Healed! Hello, Alexa! I enjoy all the ones you listed, but I think my favorite is 2nd chances, maybe because they are full of hope. I’m looking forward to this book releasing. Hello, Becky Smith! I absolutely love second chance stories! Thank you so much for commenting! Hello, Wemble! I agree on all you just said. Love triangles is probably my least favorite romance trope. Thank you for sharing! Thank you for sharing, Ellie! To think about it, I like single moms trope, too. And single dads! Hi Alexa! Thanks for your thought provoking blog, making me think and explore my reading of romance. A luxury that I can now explore as a retired literature teacher. As a retiree, I enjoy reading romances about second chances or marriage of convenience between older couples. Who doesn’t wonder “What if I would NOW (as a retiree) meet my youth retreat heart throb. Now living in two different countries (USA & Canada) would no longer be a hinderance to a relationship, as it was in our twenties.” As a German American, who struggled as an immigrant and has traveled the world, I enjoy forbidden love romances and / or fish out of water romances. Regardless of the romance trope, I agree with Wemble that the romance needs to be well written – not a formulaic conflict, theme, or story. Being retired 6 years, there are times that I am romanced out and I take a break from the genre and romance tropes. Alexa, I enjoyed Heart Unbroken and have Heart Healed on preorder. Best wishes and Happy Writing. Hello, Renate! Thank you for always being such a great support! And the story you mentioned would be interesting to write and read. I totally forgot about fish out of water trope. I love them for the same reason you do. I could relate so easily. I’m thrilled you enjoyed Heart Unbrooken, and thank you so much for pre-ordering Heart Healed! I like second chances and small towns the best. Thank you for stopping by, Lori! Oh, I love, love, love small town romances! So many different types of stories! Second chances and friends-to-romantic-love are my favourites, I think. I really want to do some more marriage of convenience stories. La Risposta, the final book in A Tuscan Legacy, was a MoC, and I have two other unfinished stories that centre on them. LOL, and a whole series of princess MoC stories planned. It’s just getting time to write them! Those sound really good! Can’t wait to see what God places on your heart and you write! And I second Marylin! Can’t wait to read it! I can so relate! So many ideas and so little time! I never thought I’d write a modern marriage of convenience story, and I loved it. Thank you so much for commenting, Autumn! I read romance almost exclusively so I have a hard time choosing a trope, since I love so many. 😉 My top ones are friends into more, opposites attract, and, surprisingly, marriage of convenience (mail order bride stories just fascinate me for some reason). Lila Diller, I love the tropes you mentioned, except for marriage of convenience. It wasn’t one of my favorite, until I started writing the story about it. :) Thank you so much for commenting! I don’t know if I have a favorite. I love all the romance stories I’ve read. I do like marriage of convenience though, second chances and opposites attract. I’m not really sure how many tropes their are, but I’m sure I’d like them all, lol. I really enjoyed Heart Unbroken. Thank you for sharing, Andrea Byers! That’s a good answer. I do enjoy many other tropes, as well. Like Renate said, no matter the trop, it matters how well the romance is written. And so happy to hear you enjoyed Heart Unbroken! I’m like Lila and Andrea, I really don’t have any ONE favorite. I seem to like them all! Give me romance and I’m good to go. I like all different types of romance,especially where God works on our life. Oooooh, I loved what you just said, Linda Rainey! Really, the best type of book for me is where God works on our life. Thank you so much for commenting! Thank you for sharing, Diana! how to write, first person or third person, what is your choice ? Did you find it hard to write things you have never written before ? Thank you so much for sharing, Linda Marie Finn! Truly appreciate it. I write in third person. Yes, it’s difficult to write about things I’ve never written about before, and sometimes it requires a lot of research, but it’s also a lot of fun. I do stay in two genres I love and I don’t think I’ll write in other genres. Thank you for stopping by! One of my favourite romance tropes has to be when the guy realizes they can’t just be friends despite how hard they try. This can be seen with a pretend relationship where someone is doing their friend a favor or when something causes them to see their best friend in a new light–a rose coloured one. Thank you for commenting, Andrhea Goertzen! You described one of my favorite romance tropes very well! I love friends to romantic love trope. I love friends to romance, second chances, marriage of convenience, and pretend engagements. Thank you for sharing, Shannon Taylor Vannatter! I don’t think I’ve read or written pretend engagements trope yet. It sounds interesting! I like many different types of romance. Friends to lovers and second chances. Thank you for the chance. I love those tropes, too! Thank you very much for stopping by, Tracy Fritts, and best wishes in the giveaway! I really like Second Chances tropes, pride & prejudice type tropes, romance + healing tropes and romance + mystery tropes.